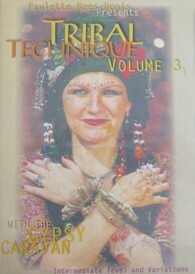 Add to the technique acquired from the previous two videos, this will inspire you with new steps and variations, including a warmup, technique demonstration, and a practice and review section with Paulette and the Gypsy Caravan Dancers. 2002. 65 min. Steps: Ghawazee with Variations, Shimmy with Variations, Arabic Walk with Variations, Double Egyptian, Double Tunisian, The Stomp, Tunisian Walk, Spanish Walk, Double Hip Bumps with 1/4 Turns, Large Corkscrew, Hip Lift / Side Step, Circle Step.